Washington Metro officials are taking action against a train operator who officials say refused to move his train because he claimed his shift had ended. The incident happened at about 8 p.m. Sunday at the Fort Totten station in Northeast D.C.
An eyewitness told News4 two Metro employees were discussing operating the train when one of the operators refused to move his train. The operator walked off the train and down the platform. The train was being repositioned within the system and was not carrying passengers at the time. But the incident lasted several minutes, according to witnesses. The train was stopped at the platform throughout the incident. Metro says the train was eventually moved out of the station by a supervisor who was present at the time. "The train operator who was to operate the train from Fort Totten to Greenbelt refused to do so, claiming he was off duty. So, his supervisor, who was on the platform, ultimately operated the train," Metro Chief spokesperson Dan Stessel wrote in an email. "Appropriate action will be taken with regard to the operator." 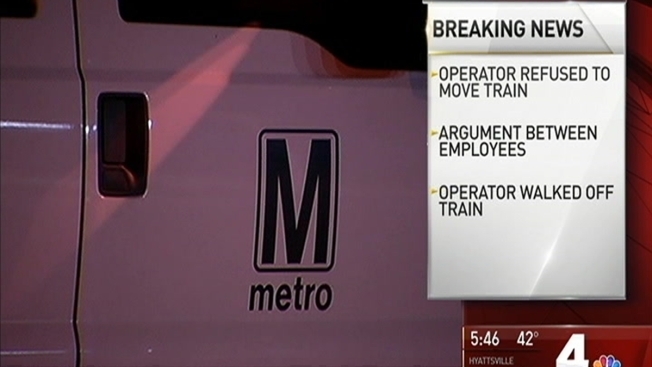 Metro's general manager, Paul Wiedefeld, said he expects employees to "use basic common sense." "We gotta find out what's going on with that, Wiedefeld said. "I expect all of our employees to use basic common sense. I understand sometimes there's work rules and things like that but we'll find out what's going on with that and we'll deal with it. "I'm asking all of our employees to step up and think about the customers first," Wiedefeld said. Metro officials say the train was never abandoned, and there was no impact to service. However, an eyewitness who wished to remain anonymous, told News4 the incident lasted well over 10 minutes and riders were waiting for other trains that were prevented from entering the Fort Totten station. A front-line Metro source told News4 this problem is indicative of the culture that Metro is trying to change. "What if that supervisor wasn't there to move that train?" one source asked. "This shows a lack of care toward the customer."